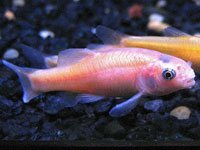 There are over 2000 identified species of the Cyprinidae fish family (the barb fish species) and the cyprinids are probably the largest group of fishes in the wild. The water requirements varies from species to species with some such as the Goldfish and the White Cloud Mountain Minnow doing well in sub-tropical water temperatures. Some of these fishes get very large, such as the Tinfoil Barb and the Bala Shark. Others, like the Harlequin Rasbora and the Zebra Danio, stay on the small side. Some can make good commnunity tank mates whereas others may not be the best choice in a community tank setup. Some that you should think twice before adding to your community aquarium would be the Red Tail Shark and the Tiger Barb. The Rainbow Shark can sometimes be very territorial as well. The "freshwater" sharks are listed here. Gets big and likes to be in schools making optimal care conditions difficult in the home aquarium. Males turn cherry red and these make excellent fish for beginning freshwater aquarium fish tank keepers. The Glofish were genetically modified with the purpose to detect environmental pollution. Scientists were able to inject a fluorescent protein gene (from marine organisms) into the zebra danio embryos to create the glofish. Another barb that is an excellent choice for newbies to the freshwater hobby. The most popular fish of all time? Our old friend the goldfish. Looks fantastic in a heavily planted and kept in schools. This is a pond fish and not suitable for most home aquariums unless you're wintering your koi indoors. A beautiful barb that is quite colorful. Not very common at the local fish store. Best kept as a single due to aggression with members of the same species. Another "freshwater shark" that is very territorial and will not do well with other red tails. Also known as the Red Barb, this fish should bring lots of activity to a tank. If being used as a feeder, they'll need to be quarantined, and medicated so that it will not pass on disease to your larger fish. It is best to breed your own rosy reds if you plan on using them as feeders. Named for the unique motion of it's caudal fin that moves like scissors. A notorious fin nipper that doesn't do all that well in community tanks. Likes to be in schools but gets too big for most freshwater tanks. The Tinfoil Barb pictured is a juvenile. Can tolerate colder water temperatures and can be very active and easy to breed. Another very popular freshwater fish that used to be used to cycle new tanks. We don't do that anymore, right?